Check out each of the costumes and weapons available to Scorpion in Mortal Kombat 11 with Shacknews' exclusive gameplay video. Everything we've seen about Mortal Kombat 11 so far paints the picture of a stylish game absolutely drenched in blood and guts. It goes without saying, but that's exactly what series fans have come to expect. Of course, that's not to say that the game doesn't feature modern touches, and series followers can get a glimpse of such additions in Shacknews' exclusive gameplay footage showcasing Scorpion's suite of weapons and costumes. Perhaps one of the most iconic Kombatants in Mortal Kombat history, Scorpion has been around since the series was first introduced. He's gone through several different iterations, of course, each one being slightly tweaked from the previous version. As can be seen in the video above, the latest version can be equipped with all sorts of different accessories and visual styles. Chief among Scorpion's customization options are his weapons, which extend from the Ageru Tsuki Ammo Blade down to the sinister orange-tinged blade known as Fumio Hasashi's Wrath. All of them appear to be in-line with a ninja- or samurai-based heritage, meaning Scorpion can make use of ninjato, daito, kunai, and the rope dart (or, in this case, the spear), which perhaps the most recognizable of Scorpion's many weapons. The fun continues into cosmetics, too. There are several different skin and facial options, including those with and without the fighter's face covered as well as a variety of different color schemes. Finally, there are four different cinematics players can choose from: Two introduction and two victory animations are offered, each one as stylish as the last. 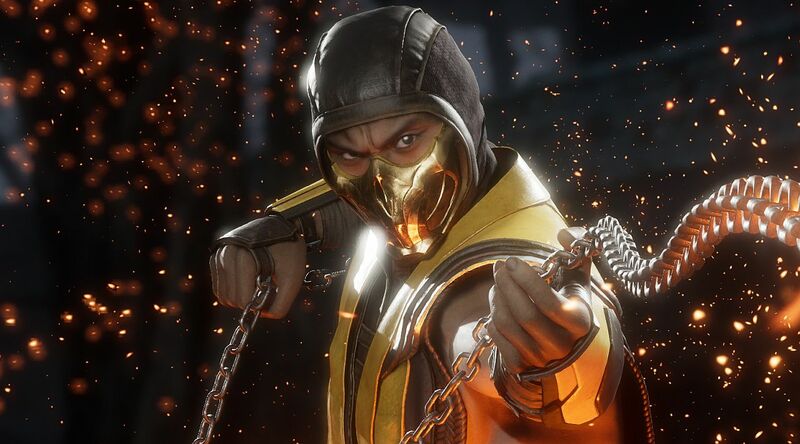 Mortal Kombat 11 releases for PlayStation 4, Xbox One, Nintendo Switch, and PC on April 23, 2019. For even more in-depth gameplay video footage, head on over to the Shacknews and the GamerHubTV channels over on YouTube.